My first three months of chicken husbandry was a lot more work than it needed to be. Taking the chickens outside every day and carrying them back inside every night was a hassle and quite time consuming. Thankfully that is behind me. It took nearly three months to get around to it but I finally finished my chicken tractor. 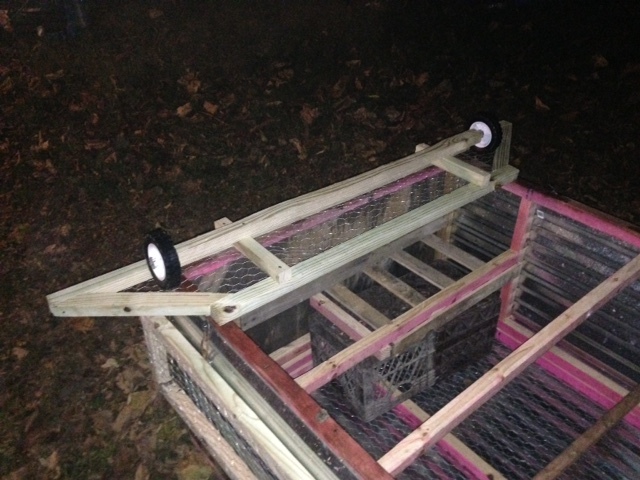 The original chicken tractor was done months ago but I wanted mine to be more predator-proof. So last Wednesday, despite being run down from two weeks of long office hours, I got a second wind and four hours later, it was done. The extra step was to attach out-rigging to the base of the pen to prevent predators from digging under the edges. I think this is a pretty good idea. I expected that lifting the out-rigging during moves would be an issue and had planned for an elaborate pulley system. Luckily the out-rigging doesn’t cause any issues at all. I attached the pull rope to the front rigging so it lifts automatically. The two sides stay in the out position as the back edge never looses contact with the ground. And the tail end (that is identical to the front) just slides along as I pull. It works GREAT! One problem I did have was that hinges are expensive. Not so much individually but I needed eight of them and that began to add up quickly. So (and I think this is one of my best ideas ever) I used links of chain instead. I simply took an old chain and cut sections of three links per hinge. Then I screwed them in place with washers (which I just happen to have exactly the right amount of in my scrap bucket – not that they cost much). The out-rigging was made out of four pressure treated 2x4x10′ that I ripped down the center. My coup is 4×8, so the extra two foot of left over was used as the end pieces of the sides. The front and end is 6′ tapering to 4′ (truthfully, this happened because I meant to use 2x4x12′ but it turned out to look great). The final diagonal bits were constructed out of scrap I had from the original coup build. 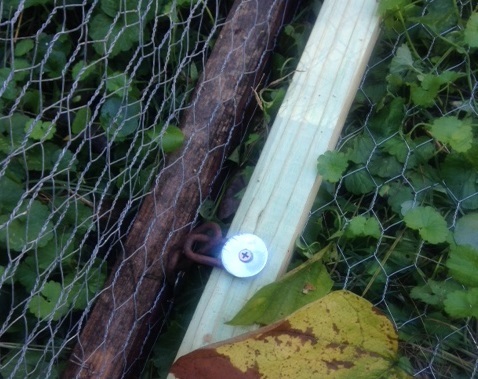 Time will tell if my chicken tractor is truly predator-proof. However, I think this is great solution that only added $30 more to my overall cost. The best part is that now it only takes me about two minutes to feed, water, and move my chickens each afternoon. I also attached some wheels that I haven’t used since the night I first put them on. The tractor is light enough that I really don’t need them. 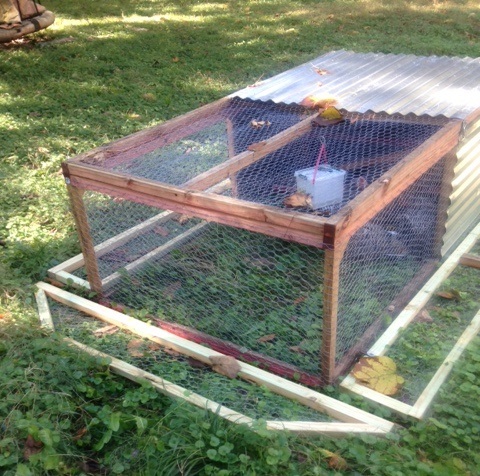 So that’s my predator-proof chicken tractor. Leave a comment and let me know what you think.